If New Jersey was the crossroads of the Revolutionary War (or the cockpit, as others have said), Morris County was the arsenal. It was no coincidence that Washington spent a fair amount of his time here: the hills were full of iron which were used to make guns and ammunition, making the area well worthy of defending. 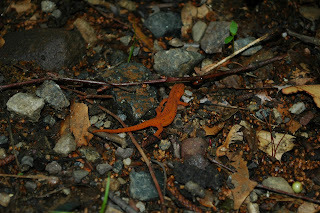 Ivan and I braved the mosquitoes on Memorial Day to check out the Mount Hope mining area in Rockaway. I'd remembered that several years ago, a developer wanted to build a pumped storage hydro power plant in the area, capitalizing on the long shafts of a huge iron mine that had been tapped out and abandoned many years ago. Essentially, pumped storage uses two reservoir areas, one higher than the other, and connected by shafts with turbines in them. Power is created when water is released from the upper reservoir into the shafts, turning the turbines as the water flows downward. Gravity does the work. As part of the plan, the company was to restore several historic buildings, including a Revolutionary-era house and church. Move ahead several years, and the project has yet to move forward. Approvals from several agencies, including the Federal Energy Regulatory Commission, were needed to enable the hydro plant to connect to the electricity grid to contribute power, and, well, you know how that kind of thing goes. I had an address for the house on Mount Hope Road, but barely an idea of what to look for. When we saw signs for the Mount Hope Historical Park, we thought we'd found it, but instead we'd found a new adventure: a series of paths leading to a string of smallish but often deep mine holes. After parking the car, we were on our trek into the woods. Appropriate to the humidity of the day, we ran into tons of mosquitoes along the rocky path. 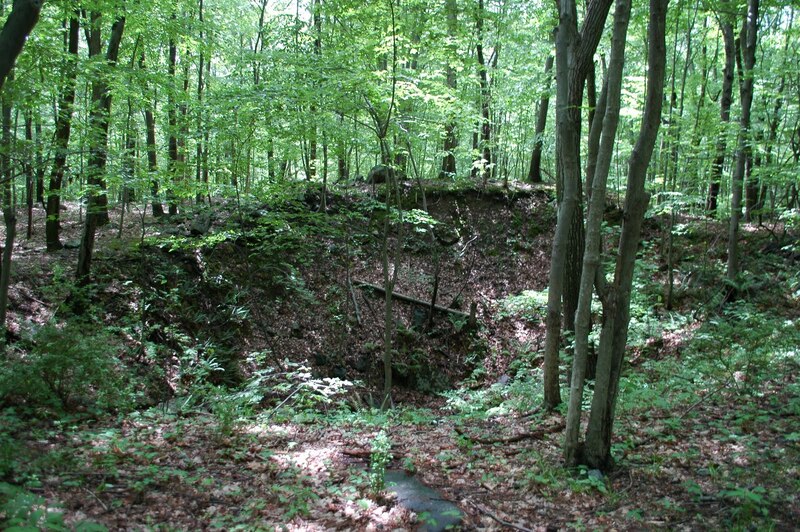 It didn't take long for us to find the first mine pits, also known as subsidence pits that once led to mines developed by John Jacob Faesch just before the Revolutionary war. 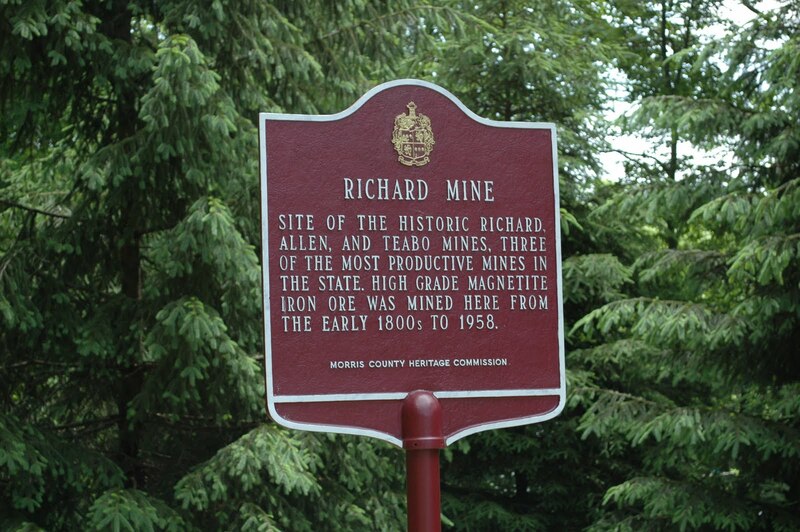 The property had been mined for about 50 years before he'd come to it, but he's considered to be the first true developer of large-scale iron mining in the Mount Hope area. The trail map showed we weren't far from the Picatinny Arsenal run by the U.S. Government. You can still see evidence of the stone paths that were probably used to cart the iron ore out of the mine area, and there's some sign of a few building foundations well into the woods. That said, it's still hard to believe that the tract was mined until the late 1950's. It's amazing how quickly nature will reclaim land that man leaves fallow. 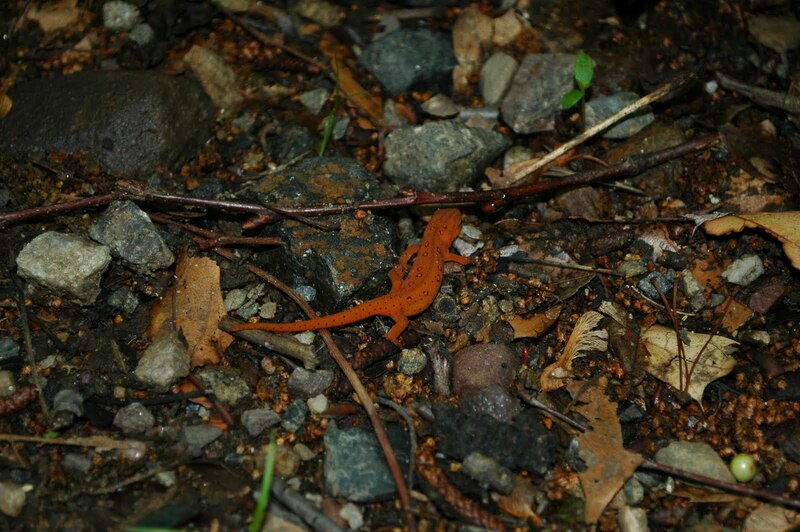 While we were there, Ivan heard a host of songbirds and even spotted a neat little reddish-orange Eastern Newt eft dashing through the underbrush of leaves.